Quite often, my job causes me to have to hop over to the more scenic sister isle for work. Tomorrow I will be once again hopping a 20 minute flight. This time I will be spending 4 days and 3 nights. I leave on Wednesday and head straight to the hotel so no court. I then have court on Thursday and Friday and I leave again on Saturday. The third night, Friday night into Saturday was optional on my part. I could have left on Friday after court but I’m staying an extra night/day for a mini one night vacay with a friend who is hopping over to join me. But I need two days worth of work clothes and two days worth of none work clothes. Avoid checking luggage – This time I am attempting not to check a bag. This one is tricky as I typically carry one bag/small suitcase and my handbag and laptop bag. Since I have to carry my laptop, up until this point, I have checked a bag to reduce the shear load since I have a handbag and laptop bag already. I am a short girl only 4’11 and I look ridiculous logging around 10 bags. So, this time I plan to take the laptop bag will be with me and my handbag will be packed in the carry on baggy. Don’t over-pack – I am typically an over-packer and probably am better at packing for long, far trips like Australia, India or Europe. 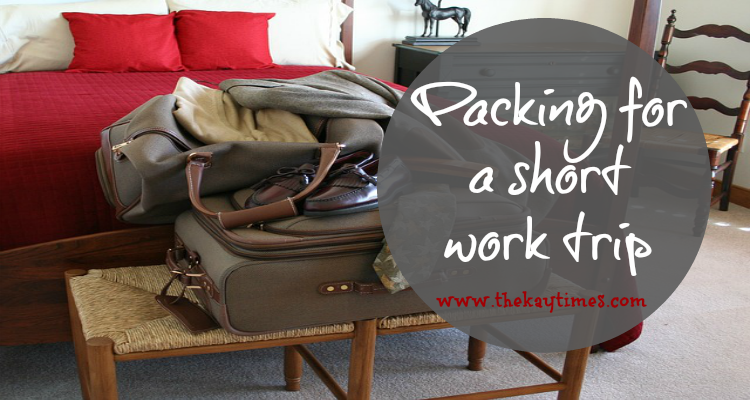 But over-packing is a big no no for the work trip, near or far really. Limit the number of items you pack. The next two point flow from this one. Pack Black – yeah yeah I wear a lot of black but it makes sense on a work trip. Easier to mix and match outfits and therefore pack less. Not hard for me since 99.9% of my clothes are in fact black. Pack versatile items to save space – This goes along with the above tip. Can one work trousers be worn two days in a row with a different jacket and shirt to make a completely different outfit? totally! Work items – This is a no brainer, make sure you have all work documents. Pack some items other than “work stuff” – Pack exercise clothes if more than one day or an oufit for the evenings/ nights. Wallet and handbag packed in carry on! So that’s what I’m packing for 4 days and 3 nights, with the last night being a night where I’d possibly be heading out of the hotel to eat and drink a bit. This is really the first time that I am not just throwing a million things into my suitcase with reckless abandon. HA! The works suits I am fine with because I am choosing two of my faves, and I generally love wearing suits anyway! It’s everything else I am worried about. So lets hope I don’t have a panic attic because of my lack of options. Previous Post Happy Birthday TKT!